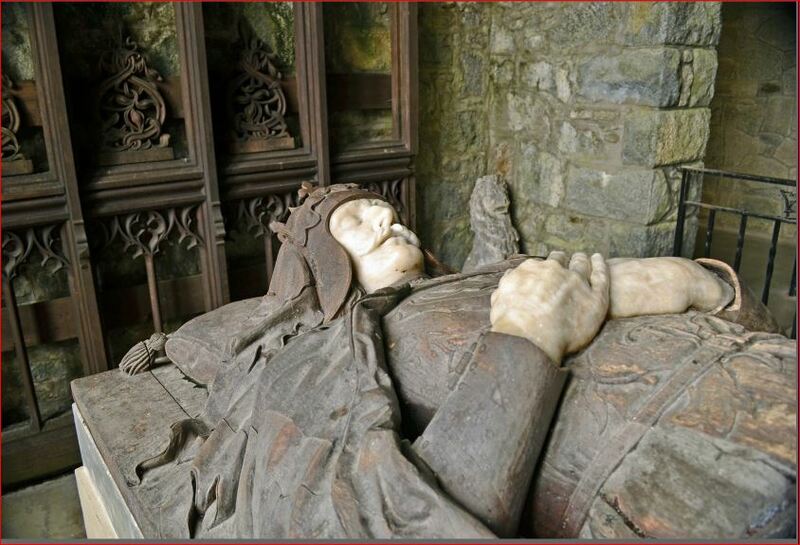 The death of King Robert I in 1329 was as poignant as his life had been. In the last few years of his life, he suffered from a disfiguring illness. Some have said leprosy but there is no proof of this. He had desired to make a crusade to the Holy Land as all good knights did but that didn’t happen. Once he knew his days were numbered, he made a pilgrimage to St. Ninian’s Shrine at Whithorn in Galloway where he fasted and prayed for four days in penance. Then he ordered his heart removed after death and taken to the Holy Land on crusade. This, his chief commander, Sir James Douglas did. Most of the small party, including James Douglas were lost in battle. The two men who remained found Bruce’s heart, which was contained in a small casket, on the battlefield and brought it back to Scotland. 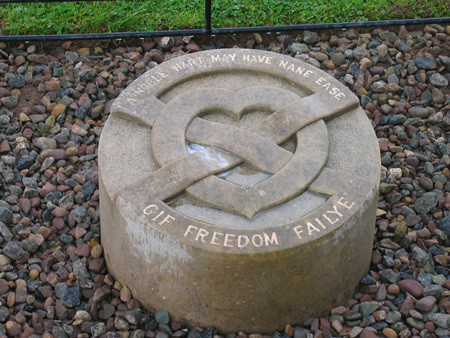 It was buried at Melrose Abbey in Roxburghshire. 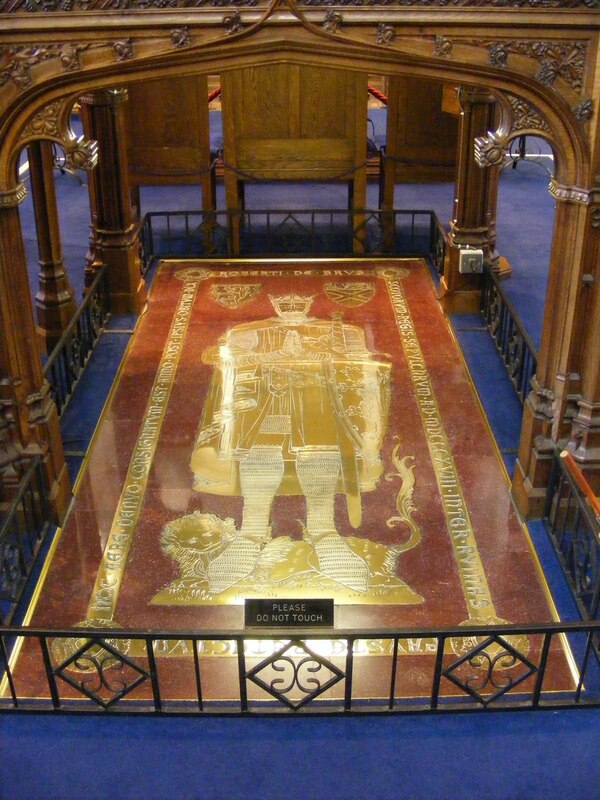 The King was buried at Dumfermline Abbey, beneath the high altar beside his queen, Elizabeth. An alabaster tomb covered in gold leaf was made in Paris and placed over the grave. Below, the present tomb. His heart, buried with an inscription which we may interpret as saying ” A noble heart may have no ease if freedom fails”. 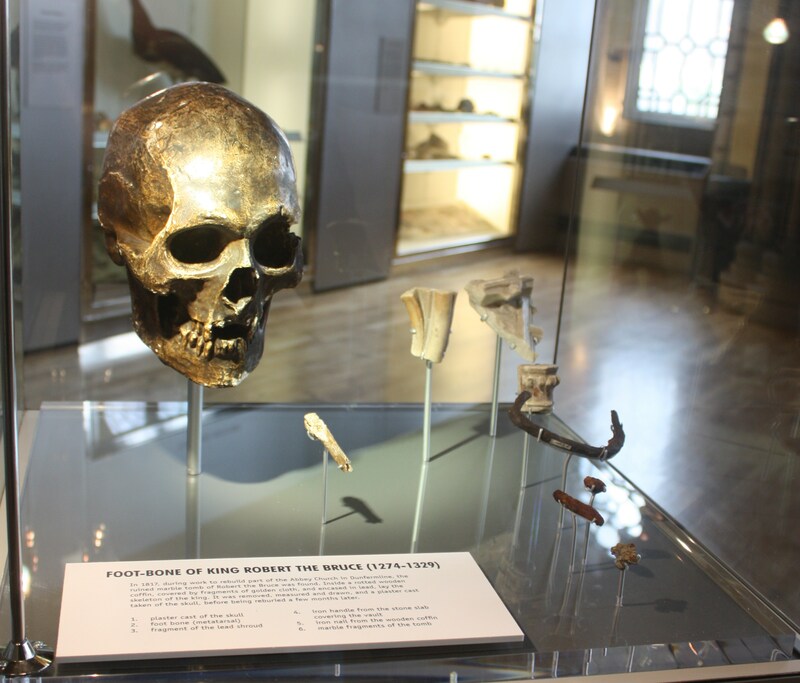 The Hunterian Museum in Glasgow has a plaster cast of his skull as well as fragments of his tomb from the discovery of it in 1818. That is an interesting story in itself. You can see what he might have looked like here. The skull had many war injuries on it according to this really interesting report about the facial reconstruction of Bruce. And finally, I like this carving of him in the Bruce Chapel at St. Conan’s Kirk in Bute and Argyll, Scotland. The head and hands are made of alabaster marble, the rest is wood. This entry was posted in Scotland and tagged Scottish History by Shamwest. Bookmark the permalink.